A full mission package for boots on the ground and those on the go. Providing mission planning, coordination, communication and gps navigation in an unbelievably small package with worldwide communication and real-time group location tracking. Perfect for Immediate Response teams and individuals working off the grid or abroad. Combine these capabilities into our private map and data hosting for information sharing between all assets on the ground. Worldwide Unlimited Tracking between all assets in the field, Unlimited SMS messaging between any Iridium or cell number and 150 free voice minutes a month. Revolutionary communication and group tracking of all your assets even while operating off the grid in a non-cellular environment. Realtime integration into our LEADNAV GPS application. You can see and communicate with all other LN-Iridium devices in the field or those back home on cellular or wifi. Integration into our LEADNAV servers for Worldwide Unlimited Tracking, Unlimited SMS messaging to any other Iridium or cell number and 150 free voice minutes a month. Revolutionary communication and group tracking of all your assets even while operating off the grid in a non-cellular environment. Realtime integration into our LEADNAV GPS application. You can see and communicate with all other LN-Iridium devices in the field or those back home or with a cellular or wifi connection. *Our custom machined EXO case and cradles are currently being designed for the new Pro 10.5" and are TBD on public availability. 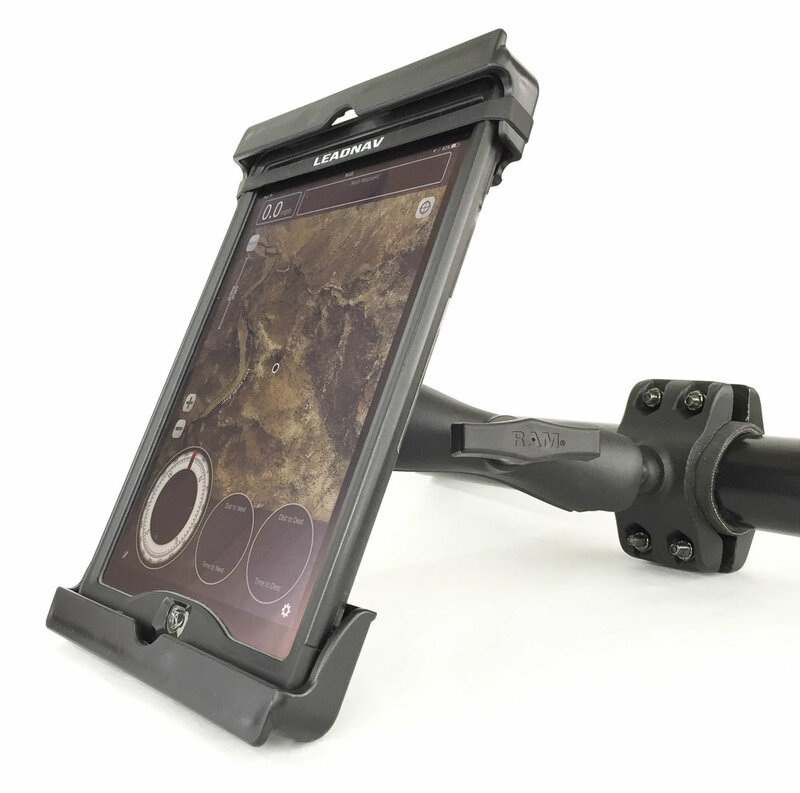 EXO's for any model iPad can be made custom for large group orders. Contact Us for minimums and pricing. Ripping the LEADNAV MultiCam Black 450X up north of Phoenix while testing out the RAM® Mounts X-GRIP® with LEADNAV GPS running on an iPhone 7. Providing audio point to point voice guidance to a bluetooth helmet unit. Next to it running the Iridium GO! in our LN-GO ruggedized billet enclosure with our service plans providing worldwide satellite communication and live group location tracking back to home camp.